Preheat your BBQ to a medium-high heat. Coat the cut pineapple in the sugar & cinnamon (we use it generously). When you are ready to BBQ, lightly oil the surface of the grill. BBQ the pineapple for approximately 15 minutes, searing all sides. Just watch it and make sure it doesn’t burn. Depending on the thickness and size of your pineapple, it could take less or more time than I have suggested. Serve on it’s own, or with ice cream! 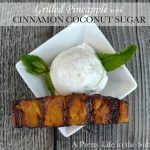 You don’t have to use coconut sugar, you can just use regular brown sugar (both taste delicious). I just found a package of coconut sugar at our Homesense store and wanted to try it. It’s sweet like sugar, and doesn’t taste like coconut. Apparently it’s supposed to have more nutrition than regular sugar. It claims to have B vitamins, and other minerals. It’s also apparently known for it’s low glycemic index. Who knows. But it did taste good!